1. Through the Bernoulli principle can be through the red wine and air in full contact, so that wine taste better. 3. as like phone size , allows you to carry, anytime, anywhere to enjoy the real taste of red wine. 3. avant-garde just when the aesthetic design, personality grade symbol. 4. FDA-approved and food-safe,the use of health-level raw materials, in line with food reference standards. Quickly sober up - specially designed internal structure to make wine sober up more quickly though Bernoulli principle. Filter impurities - semovable stainless steel filter, it can filter impurities and easy to clean. FDA-approved and food-safe. the wine aerator pourer made of acrylic and comes with a no-drip stand. Easy to carry - the size of the phone size, you can carry with you. best kitchen tool for home use & house party,picnics, outdoor, wine, gift. 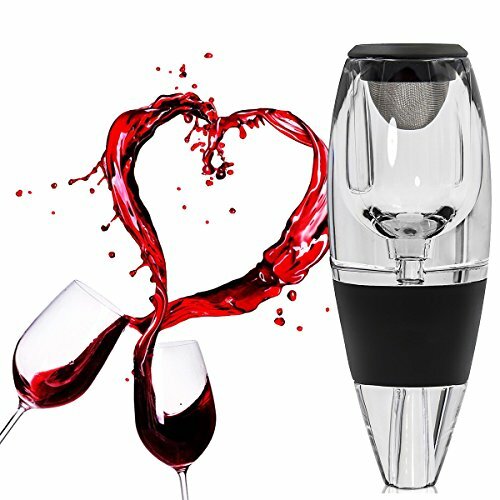 Lifetime satisfaction guaranteed- High quality guaranteedPackage including - 1* Wine Aerator Pourer Decanter,1*Filter ,1*no-drip stand. you can enjoy red wine and have a better experience. If you have any questions about this product by Ansoon, contact us by completing and submitting the form below. If you are looking for a specif part number, please include it with your message.